I have the Coast Guard version "Winter Dress Blue". Looks really sharp, can only wear it November thru March... It's really warm as it is. How did you manage to wear a uniform like that? The Ike jacket was gone by 1966 and 1549’s didn’t come along until 1967. There were cadets wearing Ike Jackets in the 1980s in my area, still. Might not have been authorized, but I doesn't mean there wasn't overlap. Our unis don't phase out at the same time as AF unis. ^ Just for clarity, those are the Feb 2018 prototypes and may not be the final version of the uniforms. Just wish they'd gotten the SMA a hat that fit better here..
Of the rumors I've heard, the third picture that Eclipse posted, with the pleated breast pocket and the waist belt is the tunic/blouse/coat design they decided to go with. The Woman's version will come with the upper false pocket flaps unattached so the Soldier can have them sewn on in a position appropriate their anatomy. This will help them line up their nametag, awards and decorations better than previous tunics/blouses/coats that did not have upper pockets of false flaps. This was asked for by the Female Soldiers that took part in the wear testing. Enlisted Soldiers will sew their rank on their shirt sleeves and unit patches, Skill Tabs and SSI-FWTS will also be worn on the shirt shoulder sleeves by Enlisted and Officers alike. The debate for Officer Shirts is to either pin a Rank and a Branch insignia on the shirt collars (see the female Major in Eclipse's first picture) or to add epaulets to the shirt and wear brown Rank slides (see the major in OldGuy's picture in the Pregnancy Uniform), similar to the black slides that are currently worn with the Blues and with the old Greens. This would mean they'd have two different shirts for Officers and Enlisted or Enlisted would have epaulets that were not used on their shirts. I hope they go with the slides, they're just easier. That should look a lot better, although it would add time for females to get them ready. They're probably happy about it. Second on that. Used to think berets were cool. Until I had to wear one. PITA. I like that. Definite throwback, but a welcome one. No reason that you shouldn't be able to identify someone's unit just because they're only wearing a shirt. I'd like to see them go with branch and rank on the collars. Slides are OK, but I like the historical significance. Maybe ditch epaulets altogether, the shirts might be a tad cheaper. 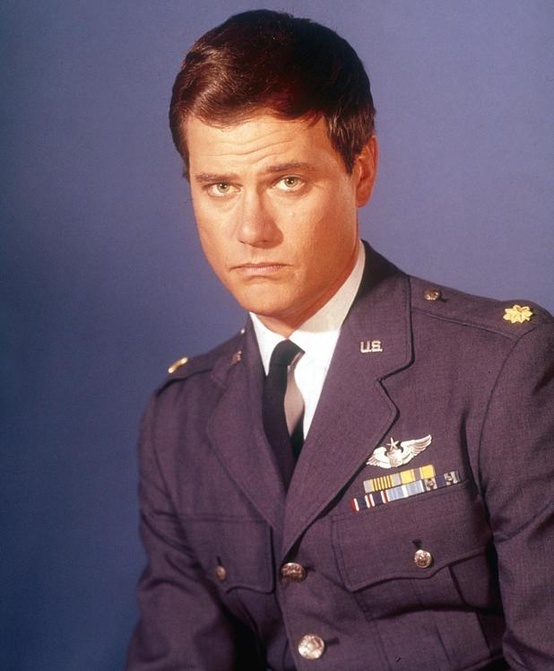 I recognize that USAF uniform phase out dates don’t always match CAP phase out dates. Not that my eyes are the only collection source, but not only did I never see Ike jackets worn past 1967, I never even saw a photo of anyone wearing them. And that includes both CAP Times and CAP News, with their notorious uniform gaffes. Sounds like you were in a renegade unit if you saw them worn in CAP in 1980 and beyond. Yup. Macomb Group III, the MI Wing group with the squadrons ranked 1, 2 & 3 in the nation one year. Bunch of renegades. What I suspect happened is that this cadet found an Ike jacket that fit her at a surplus store and wore that instead of her Detroit Lions jacket when it got cold. 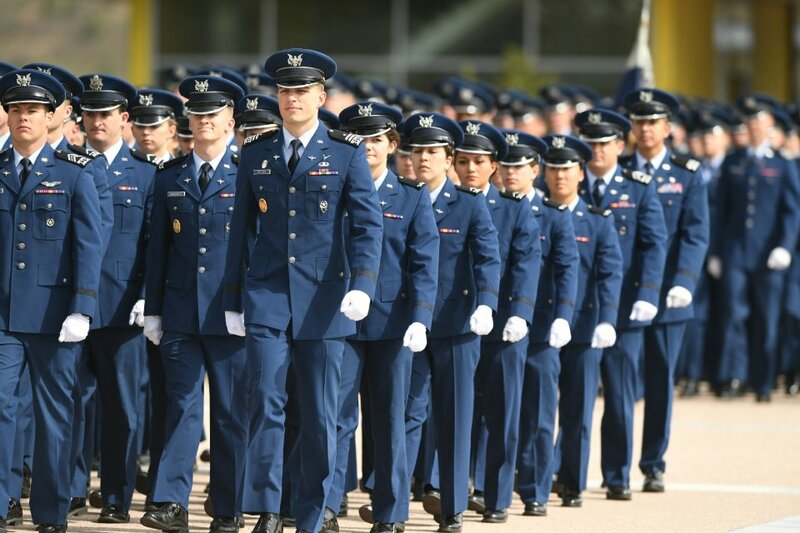 "I mean, its Air Force, its blue, whats wrong with this?" I'm not saying it was right, and I'm 100% sure (as are you) that it was way, way beyond authorized (I have a copy of the 39-1 from that time frame. Nope, not authorized). But I sure did see it. I will have to see if one of my buddies from her squadron has any pics. WIWAC, I was all about the beret (as most cadets are, right?). Years later, when I went in the USAC, I was like "Oh boy, berets! And everybody has them, so yeah!" About 15 minutes into that whole thing, after about the 3rd time I had to try to put the stupid thing on one-handed while going outside, I was like "Who's @#$% stupid idea was this? Shinseki!" Does anyone know that this uniform was only for officers, 1930s-1950s? Actually, later than 1930! More like 1941-1950. A book I have on US Army uniforms states the service coat was a modernization of the old WWI blouse made by opening up the collar, and approved by Chief of Staff, MacArthur. Yep, the same who would later become famous in the Pacific. There were several versions, itg getting updated later with broader shoulders, belt holders, and other modifications. The trousers were the same brown of the coat. It was not until 1940 or later that combination was worn! That explanation makes sense, now that the context is clearer. The first post led me to believe that cadets were wearing Ike jackets in the 1980’s as part of the uniform, with badges, patches etc. 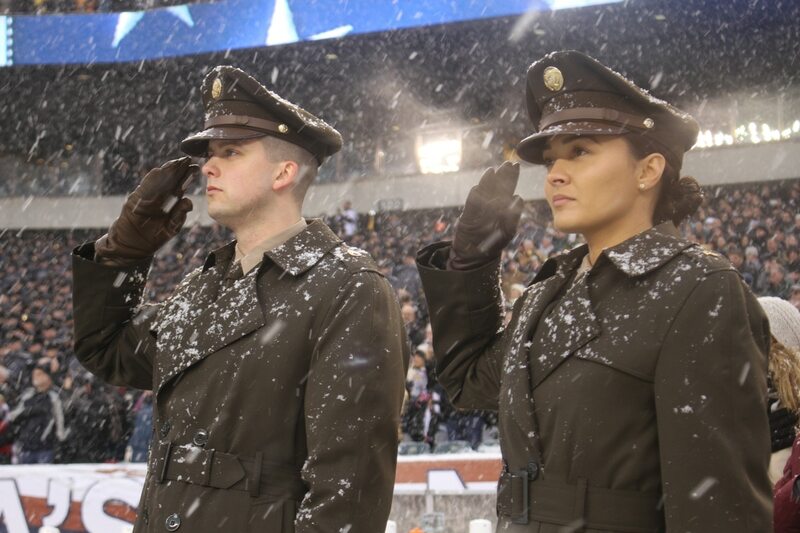 The second post clarifies that they were worn as a FORMER uniform item, morphing into what had become a civilian item used to keep the chill off cold cadets in the absence of a uniform coat. I’m assuming that the insignia had been removed. I saw something similar in 1967. The former uniform item informally known as the “Jungle Jim” (a khaki bush jacket), once devoid of insignia, became a popular motorcycle jacket for cadets who wore them with the silver tan 1505 uniform. Once the jacket was in and the helmet replaced the uniform cap, the effect was a kid on a motorcycle wearing tan clothes. Once at the meeting the jacket came off, helmet came off, flight cap or service cap went on and that was it. Who ever ok’d the Pinks and Greens must have been a Texas A&M graduate. I don't think the SMA went to A&M but I could be mistaken. Indeed they were! Darned good looking uniforms, in my opinion! The Army and Marine Corps have always shared similar uniforms. At the turn of the last Century, the uniforms of the Army Field Artillery and Coastal Artillery were nearly identical to the Marine Corps Uniform except for Buttons Collar devices and Hat Badge. During WWI, Marines were issued Army Uniforms for ease of the Logistical requirements of both Services in France. 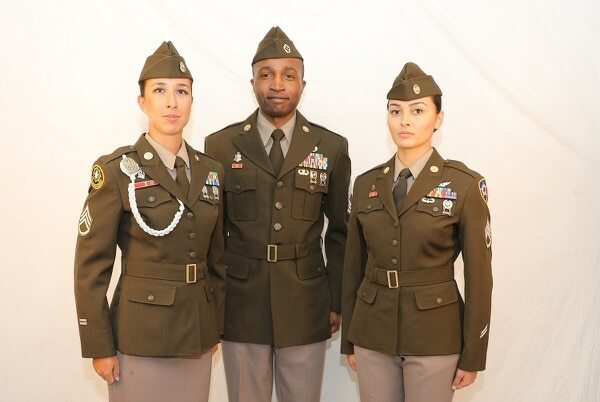 The colors of the WWII Pinks and Greens were clearly different from the Forrest Green of the Marine Service Uniform, the same will be true of these modern versions and the current Marine Service Uniform. A bit more of history. The Coast Artillery came to existence when the War Department split the Field Artillery around 1905. 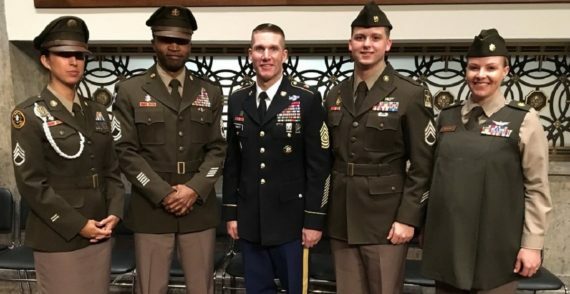 Believe me, I volunteered at Battery Gunnison, Fort Hancock New Jersey for the Army Ground Forces Association for about 5 years. We restored that battery to how it looked in 1943. And had to purchase a lot of gear. Winter Service Uniform. Summer Service Uniform. Fatigue uniform. And the Army Blue fatigues as well. Field pack. Etc. I still have my collection of DUIs. And in support of all that I had to read a lot. A lot of manuals, Coast Artillery Journals, and other books. I'm referring to the fact that Army uniforms had piping on the tunic and the trouser leg striping that matched the respective Branch color for which they served in (i.e. Cavalry - Yellow, Infantry - Light Blue, Signal Corps - Orange, etc.). 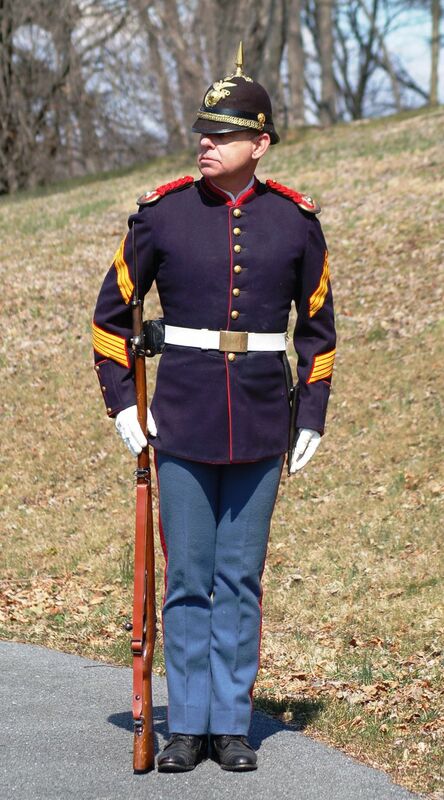 Field Artillery and Coastal Artillery Branch color was RED so the tunic piping and trouser stripe would be nearly identical to the piping and trouser stripe of the Marine Corps. Sorry but it was not clear. 1 shell, in a diamond, First Coast Artillery District. Protected Maine, Ct, RI. 3 shells, in a circle, Third Coast Artillery District. Protected Virginia, all the way down south. 4 shells, in a diamond, Fourth CA District. 1 shell atop a 9-point star, Ninth CA District. Protected the Pacific Coast. Going to a unisex uniform is a HUGE step in the right direction. Oh, I agree this change will be good. Not sure if I was clear: ASU was awful. It was alright as a Dress Uniform but a PIA for a Service Uniform, looking forward to the new Uniform. So does this mean the beret is going away? IMO, it was a major eyesore with the ASU. It looked like crap with a beret. When I was doing the Army Cadets gig, I had Class A's and then Dress Blues. Dress blues were excellent and I liked them a bunch. We made the switch to ASU and I never wore Class B ASU after that. I was unmoto to switch. If it wasn't ACUs or ASU, I wasn't doing it. Yes, if you're not in a Ranger, Airborne, Special Forces units or the Security Force Assistance Brigade no more Beret. The question is, when the ASU goes back to being just a optional Dress Uniform again, what headgear (Cover) will Specialists and below wear? Same thing they wore before the change. When the ASU was the Dress Blue Uniform, everyone wore a Barracks Cover and had Gold Striping on the Trouser legs. When it became the ASU, Specialists and below lost the Gold Striping and only Corporals and above were authorized the Barracks Cover. I hope some good idea faery doesn't decide to keep the Beret for Dress wear. I'd like to see the Barracks Cover and Trouser striping come back for everyone. From the sounds of it, the garrison cap will be standard issue, service cap as an option. Already read something about the appropriate color jump boots being commissioned. I have a sneaking suspicion that the Airborne patch may make a comeback as well. It would be nice to see it again. The Army has already said they're brown. There is a brown jump boot out there already: Corcoran Historical Jump Boot . 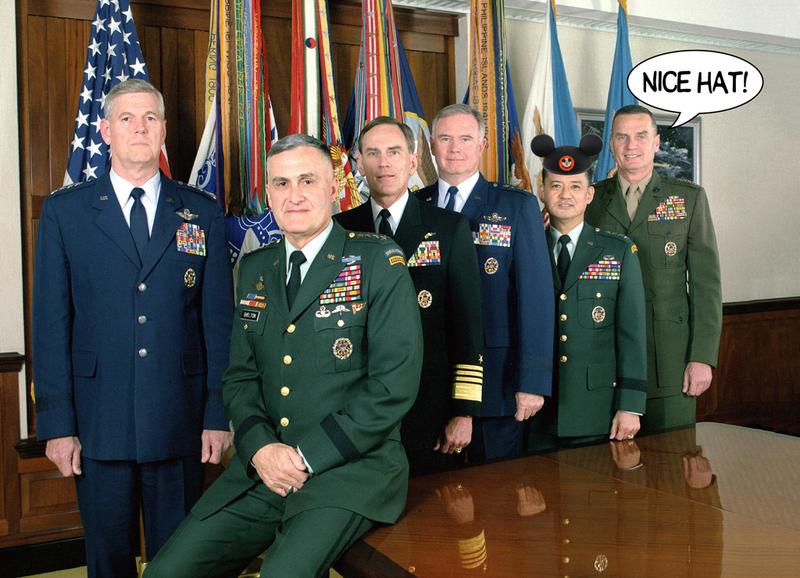 Hopefully, the Army will be smart, and just go with that one. No need to reinvent the wheel, but you never know with the government.